There is a Linux Quake HOWTO written by Stevenuas that is extensive and should be your first stop. It provides guidance on how to run mods and fix problems. There is also an interesting Wikipedia page. It is quite amazing to me that this game was released in 1996 as the successor to id's Doom series. I've played it ever since the release. It has quite a following. 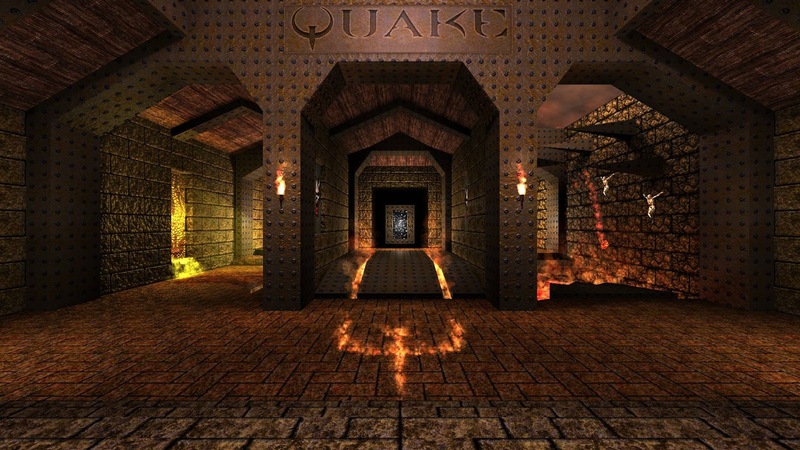 Since id Software released the source code for the Quake game engine, there have been several projects that have attempted to make not only a better playing game, but a better looking game. There are several different game engines to choose from and several hi-res texture packs to choose from. What I'm presenting here is how I configure Quake on my Linux box. The game engine I chose is the DarkPlaces game engine built by LordHavoc. He last updated it in May of 2014 and his package provides binaries "for Windows (32bit, compatible with Windows XP/Vista x64/7 x64), Linux 686, Linux amd64, and Mac OS X 10.4 or above (Intel/PowerPC), and source code compatible with Windows, MacOSX, Linux, Solaris, FreeBSD, NetBSD, and OpenBSD". The way idSoft created this game (and their other games) is to have separate game engine and data files. They typically released a shareware version of the game files containing one map. To run the complete original game, you must own the original games files named pak1.pak and pak0.pak. The Quake HOWTO above explains the process of extracting them from your original game CD. The game itself can be purchased from Amazon, eBay, or STEAM. There is no special code or password to unlock, run or install the game. The shareware PAK0.PAK file is 17883k bytes while the full version PAK0.PAK is 18251k bytes and PAK1.PAK is 10496k bytes. The shareware PAK0.PAK can be downloaded from PC Gaming Wiki, an excellent source of information on any PC game. LordHavoc also provides links to Quake art enhancements which are simply the original game textures redone to high resolution. I use Rygel's Optimized Texture Pack which makes the game look spectacular. For Linux use, created the folder for the Quake game engine files. The game engine resides in /usr/local/games/quake, and the *.pak files plus the decompressed hi-res files belong in /id1. Darkplaces offers 32- and 64-bit version as as well a SDl or GLX versions in both Linux and Win32 binaries. Select the one you want, copy it to /usr/local/games/quake and re-name it quake to make things easier on yourself. You should create a shell script /usr/local/bin. You must tell the game where its base directory is, so this is the BASH script I use. Running the game for the first time - with nothing other than the Shareware or proprietary PAK fils in /usr/local/games/quake/quake/id1 - should also create a .darkplaces directory in your home directory. This home directory is a much easier place to put mods and maps, leaving the pristine game files in /usr/local/games/quake. Importantly, if something becomes a problem, it's easier to undo. Darkplaces does not seem to recognize ~/.darkplaces as a place to put the user mods, so they will need to go in /usr/local/games/quake. Read the Quake HOWTO for details and for guides to fixing problems. The HOWTO also provides plenty of information about how to use user-made maps and other mods, some of which can be quite fun. The multiplayer maps are kept in ~/.darkplaces/maps if you have auto-downloaded any maps when you have connected to on-line game servers. A copy of a saved game for each level can be obtained from PC SAVEGAMES. Your saved games are kept in ~/.darkplaces/id1. You can't have all the levels saved at the same time as they are named s0.sav through s7.sav for each episode; you can't have all of them available at all times so you'll need to copy them in and out a you need them. DarkPlaces supports external music to be played during the game. Create id1/sound/cdtracks and place the music files there in either .mp3 or .ogg format. The music file need to be named in the following pattern, starting with track002.ogg. The Quake data track is by default trackoo1. Running user made mods, the command line is extended by appending -game . You can do this in-game by entering the console (~) and typing game. To install and run mods in DarkPlaces, see the directions at GitHUB. DarkPlaces does have a MOD launcher, but I have not had much success using it. It could very well be problems with the mods themselves as DarkPlaces is not compatible with every Quake mod. Supported mods are Nexuiz, Nehahra, GoodVsBad2, BattleMech, PrydonGate. Half-Life maps are supported (see Modding Features in teh Configuration Guide for details). Dopa is, sadly, not supported. To launch a mod from inside the game, bring up the console and enter gamedir modname. There were two official mission packs released for Quake, Scourge of Armagon and Dissolution of Eternity. If you purchase the game through STEAM, the mission packs are included ans will be found in the /hipnotic and /rogue directories that are in the same directory as /id1. The scripts are, of course, named after the Mission Pack which is also the name of the directory they reside in. You should follow this example for all such Quake scripts. A "must have" mission pack is the last commercial made Abyss of Pandemonium. However, not all the textures needed may be present. To celebrate Quake's 20th birthday, the developer behind Wolfenstein: The New Order decided to honor this classic game by releasing a new mission pack, "Episode 5: Dimension of the Past, " or DOPA. Playing Quake with the original textures will look dark and fuzzy, although it did look pretty kickass on the video cards and monitors available in 1996. Fortunately, fans have created texture packs that make use of modern graphic cards. A discussion about texture packs (with download l;inks) can be found at the STEAM Community Forums. The Quake HD Remix texture pack is a fan compilation of various texture packs available for download from here, here and from here with a slightly modified MasterEffect. YMMV, so try them both. The Rygel DarkPlaces texture pack is available in hi-res or ultra-hi-res. LordHavoc also provides Rygel's 2.7GB ultra-res pack and Rygel's 2.7GB high-res pack (a smaller version) plus Romi's rtlights packs for Quake and Hipnotic. They optimize performance when using Realtime World Lighting from the Options Menu. The Quake Retexture/Remodel Project also has hi-res graphics, but they are problematic with the DarkPlaces engine, but work well with the Tenebrae game engine, which adds stencil shadows and per-pixel lights. A video comparing it to DarkPlaces is available. You can easily experiment with different texture packs by creating different ~/.darkplaces directories and symlinking them to ~/.darkplaces. An interesting approach to playing Quake is the "Quake Done Quick" genre where the goal is to get through the entire game as fast as possible. You can watch one of the Quake Done Quick "movies" on YouTube. There are many others in this genre. A look at what Quake might look and play like if it were a new release for modern console gaming. I'm hoping that it is done tongue-in-cheek because the look and feel is absolutely horrible. With a modern game engine, modern hardware and high-resolution graphics, Quake is every bit as immersive an experience as it was as we imagined it to be in 1996 on an 8086 computer with a 640x480 display.